An improvisation theatre workshop for kids had the troupe shooting from the hip, speaking off the cuff and working on Russian accents. 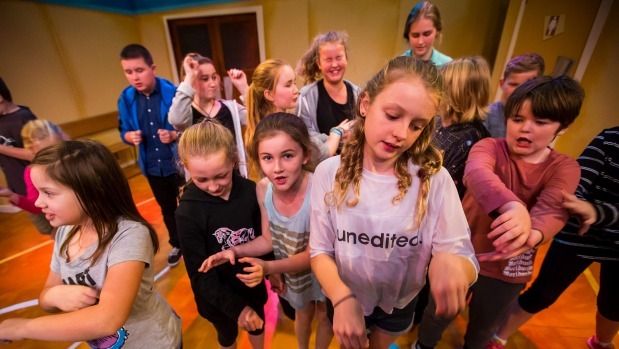 Palmerston North’s Centrepoint Theatre ran its first school holiday acting programme in the second week of the break, with a group of eight to 13 year-olds. Tutor Ben Ashby said the workshops had been popular and more were planned with a different acting theme for each holidays. Improvisation had been a fun place to start, he said. “It’s such a community theatre that we wanted to get a whole lot of kids from Palmerston North into the theatre and excited about this world of theatre, and it’s all about having fun. On the first day the children started off shy and silent, and by the end of the week were expressive, funny and not afraid to look silly, he said. Lucas Bowen, 12, said he had fun working on accents, improvisation games and getting to practice acting without being embarrassed. Exercises included ‘pop up story’, acting out a school year book photo, ‘he said she said’, and theatre sports games. “It’s great taking kids away from watching screens, getting them watching each other and being funny and telling stories,” Ashby said. A senior teen workshop and another junior workshop are planned for the July school holidays.